Do you love trains? A train baby nursery theme may be just the thing! Does the sound of a train whistle in the calm of the evening hours bring back wonderful childhood memories? Did your mom and dad take you down to the depot to see the arrival and departure of the passenger trains? Your childhood memories can be very helpful when decorating a nursery for a baby boy or girl with a train theme and add a lot of personality to the project. Is there an older brother or sister that loves collecting the Thomas the Train engines and boxcars? If so, blending the train themed childrens bedrooms will be completely seamless and so attractive! Thomas the Train room decor is a stylish and trendy way to display your series collectibles. Go here to see more items that can be used to decorate a choo choo themed nursery for a baby boy or girl. As you can see, it would be fun to include baby animals to create a combination circus and train theme. For the big boys and girls, get one of the train theme beds for kids and a complimentary set of bedding to your infant's cribset! If there's an adjoining bathroom, hang a set of train theme shower curtains! Each room will have the train theme portrayed in some very cute and different ways! No need to run to the end of the line with your train decor in the baby's room; toddlers love choo choo trains, too! 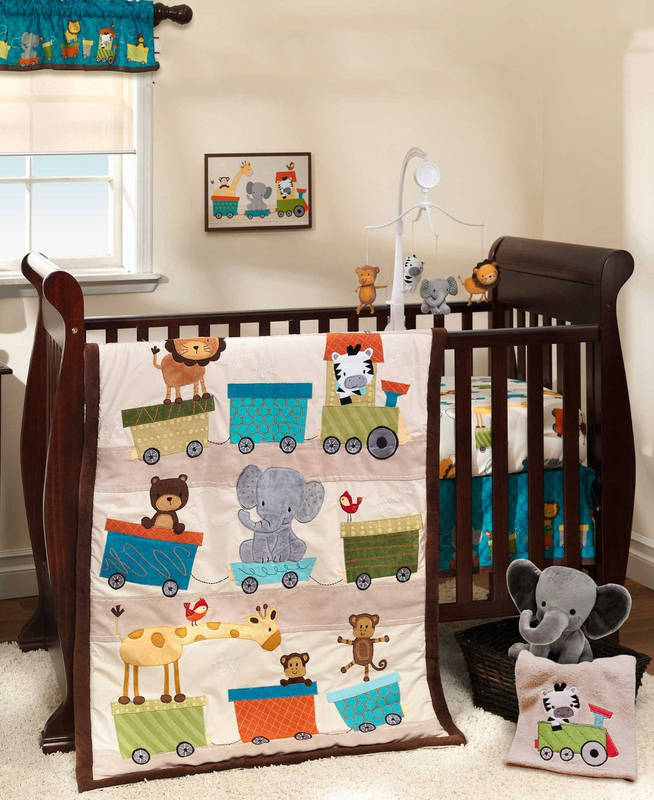 Once the cribset is purchased for your train baby nursery theme, the wheels are in motion to choose the rest of your train themed room decorations! If you feel that a train print fabric would be too busy and would overwhelm your train baby nursery theme or if you can't find THE baby bedding set that you've dreamed of at first, maybe a homemade set of crib linens using a vintage mattress ticking stripe would work? You know the kind I'm talking about, think about the engineer's and the fireman's caps and overalls or coveralls. The gray-black stripe on this classic icon looks stunning with a traditional bandanna print in a bold red, blue or even bright yellow. Take your nursery wall paint colors from the print and pull a few motifs for accents and you're on your way. A super backdrop for your train baby nursery theme would be to paint a mural with train tracks making their way through a mountainous terrain and a cloud mural painted on the ceiling or upper third of the nursery wall. Get some Thomas the Train wall stickers, wallies or wallpaper decals and arrange them on the hillside in your mural climbing over the mountains on your painted railroad tracks. Don't forget to paint the cloud of smoke coming from the smokestack. You can use a ragging or sponging paint technique to achieve this decoration so that it looks so real you can almost smell the smoke boiling out of the smokestack. What a realistic touch for your train baby nursery theme bedroom! For the nursery rug there are such cute child activity patterns available in various floor covering lines. 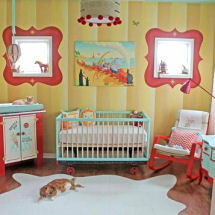 You can find transportation or construction baby theme rugs that will work with a train baby nursery theme nicely. What a cool place for baby to play on a rainy day inside! These decorating ideas can be used for large floor pillows with a railroad crossing motif or some baby pillows that will be used only when you are staging your baby's nursery for company. Crib pillows can be dangerous to use in baby's bed, so only use them when you want to dress things up and baby is not in the bed for safety's sake. Using coordinating colors, paint a wall mural of an old timey train station with eager passengers sitting on their suitcases waiting for the conductor to shout the familiar, "All aboard!." Personalize your depot destination signs with some of your baby's personal details such as his or her name. Do you have a collection a set of vintage Lionel toy trains? Lucky you! Those old train sets are highly collectible and make wonderful nursery decorations high up on shelving at eye level! It's a good idea to keep treasures such as this out of baby's reach for his safety and to protect your valuable one of a kind items. Please visit Unique Baby Gear Ideas again soon to see more more train baby nursery theme ideas with DIY décor projects and crafts that you can make yourself.